Comes amid outcry over the flying of the Confederate flag in South Carolina. The American flag was lowered to half-staff at the South Carolina state capitol last week after the deadly church shooting in Charleston, yet the Confederate "battle flag" still flies on the state capitol grounds, outraging South Carolinians and other Americans. Local politicians and leaders held a joint news conference this morning to call for the Confederate flag, currently flying, by law, at full-staff, to be to be removed entirely from the site, and Gov. Nikki Haley is expected to make a statement on the issue this afternoon. But though the controversy is focused this week on South Carolina, it is not the only state to have the remnants of the Confederacy in its state symbol. There are at least five other states that recently had or still have symbolic references to the flag, which, as Charleston Mayor Joe Riley said, "years and years ago was appropriated as a symbol of hate." Here are the other states whose flags are coming under scrutiny in light of the South Carolina debate. 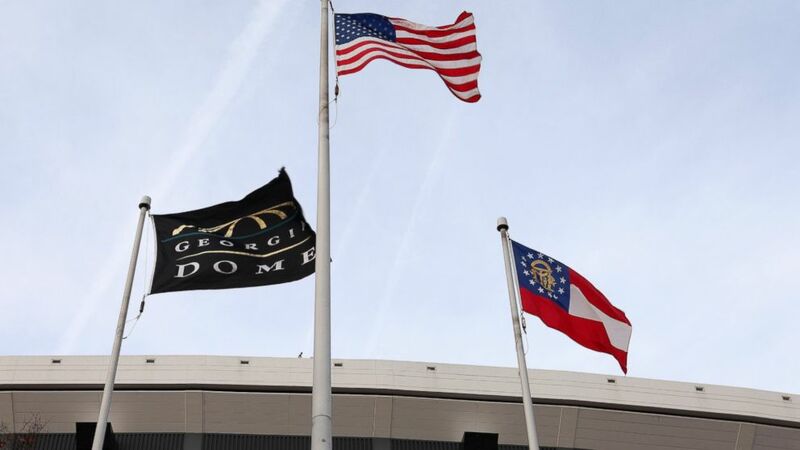 (Raymond Boyd/Getty Images) Georgia Dome Flag, American Flag and the Georgia State Flag, flies outside the Georgia Dome in Atlanta, Georgia on Nov. 23, 2013. The Georgia state flag isn't what most Americans commonly recognize as the Confederate flag, but it is is actually based on an earlier version. That earlier version prominently featured the "Battle Flag of the Army of Northern Virginia," which is the commonly recognized version of the Confederate flag. The current version was adopted in 2003 after two years of debate over the specifics of the flag, as described in "The New Georgia Encyclopedia". The flag used today is based on the first national flag of the Confederacy (dubbed the "Stars and Bars"), with the Georgia state seal inside the circle of stars and "In God We Trust" written below. "This legacy did not go unnoticed by African American legislators and others -- but most expressed a willingness to allow this tribute because they did not see it as a symbol widely associated with racist groups," reads "The New Georgia Encyclopedia," which is run through a partnership with groups including the governor's office and the University of Georgia Press. (Bernard Weil/Toronto Star via Getty Images) In this file photo taken on Dec. 12, 2001, Harry Sharp proudly holds the Mississippi State flag in the centre of Vicksberg Miss. The upper-right corner of the Mississippi flag is a smaller version of the Confederacy's battle flag, which is referred to as the Beauregard battle flag locally. According to the Mississippi Historical Society, there have been more than a dozen flags used in Mississippi, including several with clear ties to European countries that ruled the state at various points in its history. The one in use today was first adopted in 1894 and was designed by state senator E.N. Scudder. His daughter spoke at a convention in 1924 and plainly said that it was in tribute to fallen confederate soldiers. "My father loved the memory of the valor and courage of those brave men who wore the grey," Fayssoux Scudder Corneil said in 1924, according to the historical society. "He told me that it was a simple matter for him to design the flag because he wanted to perpetuate in a legal and lasting way that dear battle flag under which so many of our people had so gloriously fought." 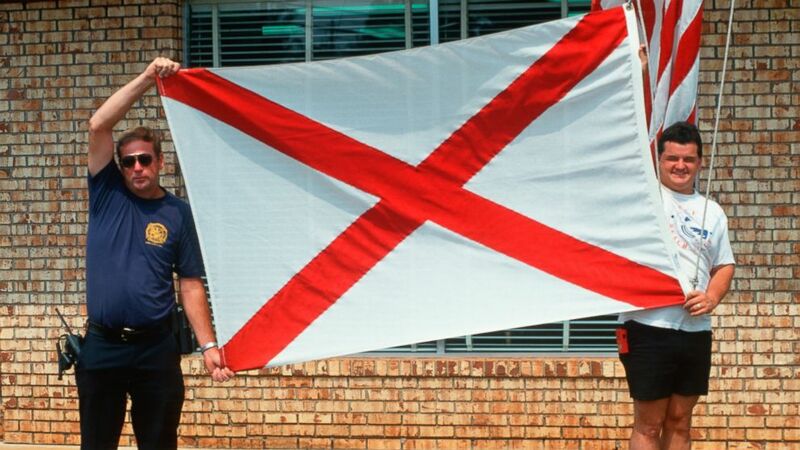 (UIG via Getty Images) The state flag of Alabama is see in this 2003 file photo. Though there is no blue and no stars in the Alabama flag, it does have the bearings of the Confederate ideals. 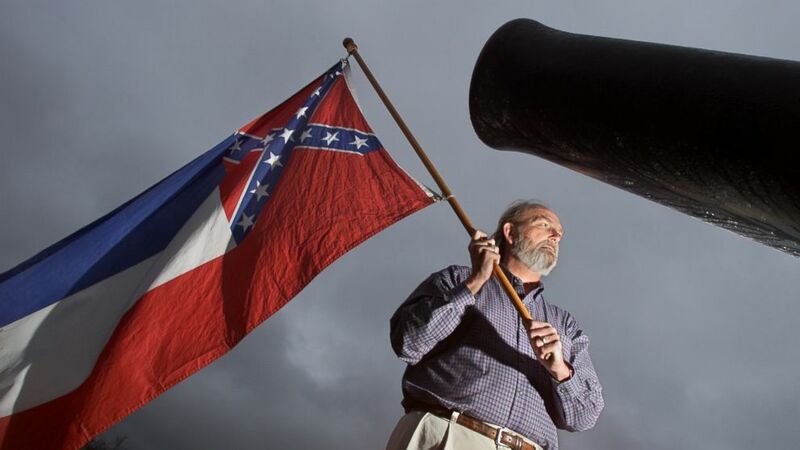 The Alabama state archives' online database cites the work of Dr. Thomas Owen, a former director of the Alabama Department of Archives and History, who noted ties between the state flag and the Confederate battle flag. Shortly before 1915, Owen concluded that the flag was designed to "preserve in permanent form some of the more distinctive features of the Confederate battle flag, particularly the St. Andrew’s cross," the archives state. 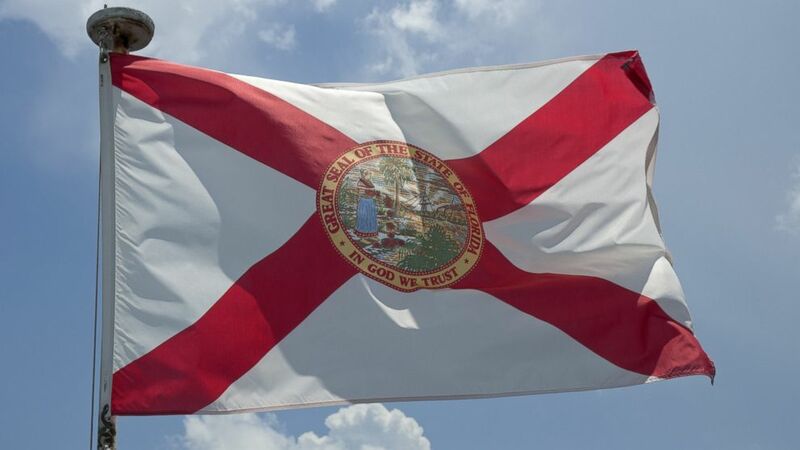 (Getty Images) The Florida State flag is seen in this undated file photo. The Florida state flag is very similar to that of Alabama, with the addition of Florida's state seal in the center. However, the "stainless banner," a white flag with the battle flag in the upper-left corner, was removed from the state Capitol in 2001 while Jeb Bush was governor. Bush today said he believes the Confederate flag should be removed from the South Carolina capitol. "My position on how to address the Confederate flag is clear. In Florida, we acted, moving the flag from the state grounds to a museum where it belonged," Bush said in a statement released Saturday. (Rodger Mallison/Fort Worth Star-Telegram/MCT via Getty Images) Arkansas cheerleaders perform a routine in front of their state flag at Cowboys Stadium in Arlington, Texas, on Oct. 1, 2011. Stars in the shape of a diamond may hint at the Confederate battle flag, but that is actually not the Arkansas state flag's connection to the Confederacy. Instead, the tie is the single star placed above the state name at the center of the flag. State historian Dr. John Ferguson said on the Arkansas secretary of state's website that the star was added in 1924 to represent the state's former membership in the Confederacy. (George Walker IV/The Temmessean/AP Photo) Tennessee State Park Ranger Don Fend changes out the state flags at the Bicentennial Mall, Jan. 31, 2012 in Nashville, Tenn. 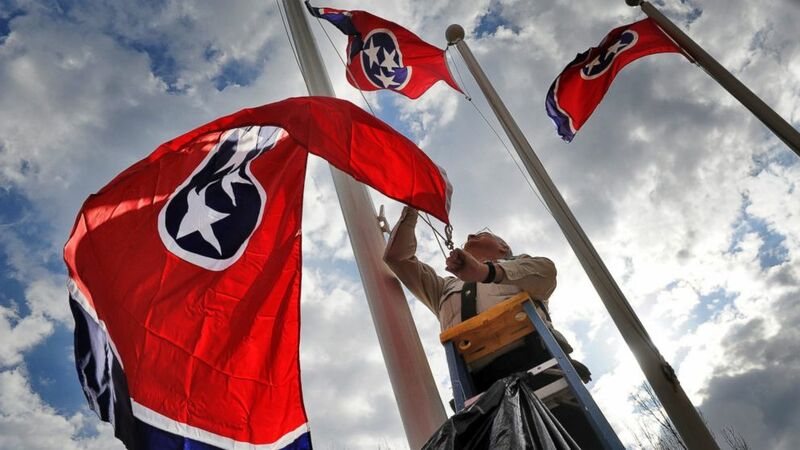 Though there are visible similarities between the Tennessee state flag and the Confederate flags, such as a red background and a circle involving stars, the official state account of the symbolism involved does not list a connection. According to the state website, the flag was adopted in 1905 and the three stars are used to symbolize the three geographic divisions of the state: the East, the Middle and the West.